he Royal Academy of Arts in London, membership of which constitutes the Art Peerage of Great Britain, was founded in 1768, for the purpose of cultivating and improving the arts of painting, sculpture, and architecture. The memorial presented to George III., asking for its charter, stated that the two principal objects in view were the establishment of a well-regulated school or academy of design, and an annual exhibition open to all artists of distinguished merit. The plan of constitution was approved and signed by the King December 10, 1768. Among the thirty-six original members were Reynolds, Gainsborough, Benjamin West, Mary Moser, and Angelica Kaufmann. The first President was Sir Joshua Reynolds, succeeded in 1792 by Benjamin West. The active members of the Royal Academy are divided into Academicians (painters, sculptors, architects, and engravers), Associates, and Associate Engravers. The number of members has varied from time to time. There are in 1884 forty-two Academicians and thirty-one Associate Academicians. Beside the active mernbers there are Honorary Members, Honorary Retired Academicians and Honorary Foreign Academicians. All artists whose works show sufflcient merit are permitted to contribute to its exhibitions; as exhibitors they are eligible to election as Associates, and are chosen by the Academicians at the annual meeting of the Academy. The Academicians themselves are chosen from among the number of Associates when vacancies occur. The Academy, since its foundation, has been under the direction and protection of Royalty. All by-laws must have the sanction and signature of the reigning sovereign to give them effect, and the approbation of the monarch is necessary to make valid any election as Associate, Academician, Professor, or Member of the Council. The President of the Royal Academy is knighted upon election. The annual exhibitions open on the first Monday in May, and close on the first Monday in August. No artist is allowed to exhibit more than eight different works; no work is admissible which has been already publicly exhibited in London; and all works sent for exhibition are submitted to the judgment of the Council, whose decision is final. Many works of art are sold annually at these exhibitions, the Academy receiving a small pereentage upon the sales. he schools of the Royal Academy are the most complete and most important Fine Art schools in Great Britain. There are three branches, — a school for study from casts of celebrated works of antiquity, a school for study from living models, and a school of painting. All applicants are admitted free, whose personal character is established, and whose works show indications of talent. Prizes are annually given, including a gold medal for the most deserving work. There is also a traveling studentship, occasionally bestowed upon artists of uncommon promise and merit. There are four professors chosen from among its Academicians, who lecture upon painting, sculpture, architecture, and chemistry, besides a professor of anatomy, not necessarily a member of the Academy. The Library of the Royal Academy is very complete; it contains the best works on art subjects in all languages, and continual additions are being made. There is also a fine collection of engravings from works of the masters of all times and all eountries. William Wilkins (1778-1839), National Gallery, Trafalgar Square. 1832-38. Photograph. c. 1965. Click upon image to obtain larger picture. The early exhibitions of the Royal Academy were held in Pall Mall. In 1780 the society took possession of the apartments allotted to it in Somerset House, the first exhibition there taking place in 1781. In 1836 the east wing of the National Gallery on Trafalgar Square was granted by the government to the Royal Academy, and there it remained until it removed, in 1869, to the present building, Burlington House, Piccadilly, which was purchased by the Crown in 1854. The modern structure is in the form of a hollow square, containing twelve galleries. It was erected especially for the Royal Academy, and is one of the finest public buildings in London. Under the same roof are the Chemical, Geographical, Astronomical, Antiquarian, and Royal Societies. he British Institution for the encouragement of native artists was established in 1805, but has not been in existence for some years. It was the most important rival to the Royal Academy for upwards of half a century. The gallery of this Society is open annually during the months of April, May, June, and July. All British artists are invited to exhibit. It is supported by the sale of catalogues, admission fees, the commissions on the sales of pictures, and a small annual payment of lhe members. Many very prominent British artists have belonged to this society. Its gallery is in Suffolk street, Pall Mall, East. It has also a Winter exhibition. The Dudley Gallery in London has been in existence since 1864. Its first exhibition was held in the month of April, 1865. It was organized for the public display of water-color pictures by painters who were not members of the reaular water-color societies, and who in consequence were not permitted to send their works to those galleries. It had no regular membership; the pictures were selected or rejected by a committee of management, and the exhibitions were open to all artists whose merit or skill entitled their works to the consideration of the public. In 1883 this gallery passed under new management and became The Dudley Gallery Art Society with about a hundred and fifty members. The Duke of Argyll is President, and the name of John Ruskin appears in the list of the Council. A limited number of pictures are received from non-members. In 1884 the membership had increased to nearly two hundred. Besides the spring exhibitions of water-colors, there was an annual exhibition of cabinet pictures in oil, and one of works in black and white. The Grosvenor Gallery, on New Bond street, London, is the youngest institution of its kind in Great Britain, but by no means the least important. lt was opened to the public for the first time in 1877. Like the Dudley Gallery, it has no membership. 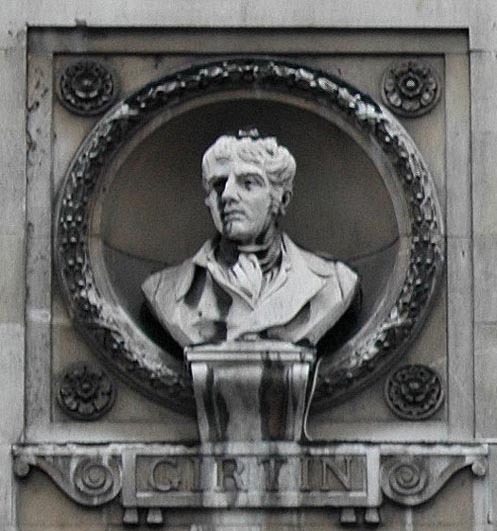 It is under the management of Sir Coutts Lindsay, to whom, on account of his efforts in behalf of this gallery, the art-loving world owes much. Its exhibitions are made up of the works of living painters and sculptors who are invited by Sir Coutts Lindsay to contribute upon these occasions. The pictures are not placed closely together, as is of necessity the rule in ordinary galleries, but a space of at least one foot is allowed on every side of each work, and all are hung in the light and position best suited to them. The consequence is that each work appears to the best advantage, and the whole has the elfect of a private salon, richly and harmoniously furnished, in which is a superb collection of the works of the modern masters. The director of the Grosvenor Gallery claims that it is not intended to rival the Royal Academy, and the works of many Academicians are seen upon its walls; but in it, nevertheless, are conspicuous the paintings of what is known as the Romantic School, with which the Council of the Academy does not seem to be in sympathy, and which in many instances were not seen by the general public until the opening of the Grosvenor Gallery. Among the better known of the contributors to these exhibitions have been, Millais, Sir Francis Grant, Sir Frederick Leighton, George D. Leslie, George H. Boughton, Burne-Jones, Alma-Tadema, Spencer Stanhope, Walter Crane, Albert Moore, Whistler, Heilbuth, Tissot, Mrs. Spartali-Stillman, and Mrs. Jopling. The gallery is open during the London season, and annually receives the attention it merits. The building it occupies was erected under the personal supervision of Sir Coutts Lindsay, by whom it is owned. It is artistic and commodious; it has two large galleries for oil-paintings, a smaller room for watercolors, and a gallery for sculpture, all admirably designed for the purposes for which they are intended. n the early part of the present century, when water-color painting began to attract popular attention in Great Britain, a number of professional artists who had devoted themselves more particularly to that branch of their art determined to form an association for its proper recognition and tlleir own mutual protection and improvement. The result was the Royal Society of Painters in Water-Colors, organized in 1804. It would appear that at that time water-color sketches and drawings were not admitted, or, if received at all, were treated with scant courtesy by the Royal Academy, and the main object of the new organization was to insure an annual exhibition in London, where the works of this still unpopular school of painting might be introduced to the public and make themselves felt. 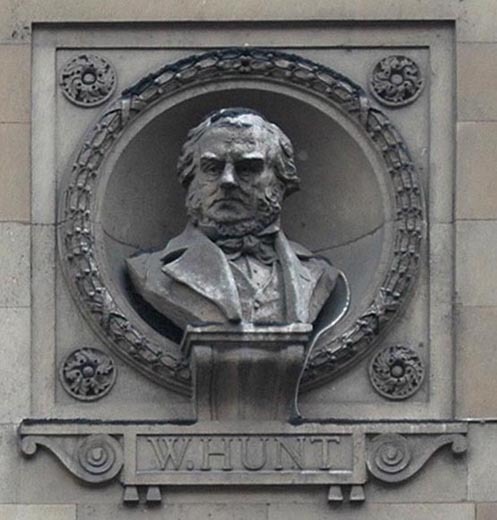 Left to right: Busts of John Robert Cozens, J. W. M. Turner, Thomas Girtin, and William Henry Hunt on the façade of the Royal Institute of Painters in Watercolour. The first exhibition was held in Lower Brooke street in 1805. For some years, while the Society was struggling for the recognition it did not at first receive, the members met in each other's houses and studios by turn, where they presented studies and sketches, which were usually left with the host of the night. The prejudice against water-colors was so strong, however, that the Society was forced to admit pictures in oil, and in 1813 it was known as the Society of Painters in Oil and Water Colors. But in 1821 the old name was resumed and only works in water-colors and by members of the Society were received at its exhibitions. Since that time it has been gaining in strength and prosperity, and is now to watcr-color art in Great Britain what the Royal Academy is to Fine Arts in general. Its President, like that of the Royal Academy, is knighted upon election. The annual exhibitions of this Society were first held in Spring Gardens; in 1821 they were removed to Egyptian Hall, Piccadilly, and at present (1884) are at 5 Pall Mall, East. The gallery is open for exhibitions twice each year. It has forty members and forty Associate Exhibitors. The Royal Institute of Painters in Water-Colors, originally known as the New Society of Painters in Water-Colors, was founded in 1831. It is an offshoot of the older society, and the result of a secession of dissatisfied members. It has followed in a great measure the constitution and laws of the parent organization, has met with marked success, and numbers among its members many of the most prominent and promising artists of the kingdom. It has (1884) ninety-two members, ten honorary members, and nine lady members. Its new galleries, specially erected for the Institute, are in Piccadilly. Shortly after the close of the first great World's Exhibition in London in 1851, when Great Britain for the first time realized her inferiority to the continental nations in the matter of artistic taste in her manufactures and in her industrial educational policy, a new section was formed in the British Privy Council, called the Department af Science and Art, which devotes itself particularly to popular instruction in the industrial arts, chiefly, thus far, in drawing and the arts of design. Two exterior views of the Henry Cole wing of the Victoria & Albert Museum. Click upon thumbnails to obtain larger pictures. The South Kensington Museum [later the Victoria and Albert Museum, founded in 1852, is the most important result of the working of this department. It cost origina]ly upwards of a million pounds sterlng, and during a quarter of a century of its existence between three and four millions sterling have been judiciously expended upon it. Collections have been made of pictures, casts, engravings, models, and objects of art of all kinds, from all nations and of all periods. These are systematically and artistically arranged, and are open to the free inspection of the public, and for the study and improvement of thousands of pupils. The National Art Training-Schools of South Kensington form without question the finest industrial art college in the world, and are so regarded by competent judges of all nations. They were established for the purpose of teaching instructors in art throudhout the kingdom, as well as for the instruetion of students in drawing, designing, and modeling, to be applied to the requirements of trade and manufacture. The course of study, which is very full and complete, is too extended to be described here, embraces twenty subjects, with sixty subdivisions. The pupil is required to present drawings, paintings, and models; to write papers on various art toipics, and to sustain rigid and thorough examinations. Left: The Victoria & Albert Museum. seen from Cromwell Road. Right: The sculpture room at the V&A. More than a thousand students (women predominating) are fitted annually in all branches of art, — painters, sculptors, engravers, lit hographers, architects, and designers, as well as pubhlic instructors. The sexes are divided in class-rooms and working -rooms while the lectures, libraries, etc. are open equally to both men and women. The examinations are the same, except that women are not required to take thc papers in machine-drawing or architecture. At the end of the course of four years, if the record of the pupil is satisfactory to the examining committee, he or she is given a diploma, which is aceepted throughout the civilized world as the highest award of excellence in that particular department. Subordinate to and connected with the schools of South Kensington are upwards of one hundred and thirty free art training-schools established by the govermnent in the more important cities and towns of the kingdom. Thc method is similar to that of the parent school, and the teachers are graduates of it. The Pirelli Courtyard in the Henry Cole wing of the Victoria & Albert Museum. The most important of these schools are those of Birmingham, Nottingham, Glasgow, Birkenhead, Belfast, Leeds, etc. In London there are about ten schools; in Dublin, Edinburgh, and Liverpool, two or more each. It is estimated that at least three hundred thousand persons are now studying art in some form in Great Britain alone. Before the organization of the South Kcnsington College, the number of British art students did not number one thousand annually, and the large proportion of these were devoting themselves to High Art. he Royal Hibernian Academy of Painting, Sculpture, and Architecture in Dublin dates from 1803. It was incorporated in 1823 and enlarged in 1861. It is under the patronage of the Queen, and the vice-patronage of the Lord-Lieutenant of Ireland. Its membership consists of Academicians, Associates, and Honorary Members. The annual exhibition of painting, sculpture, and architecture opens in February; students are admitted to the schools orl producing a certificate from the Department of Science antl Art, stating that the applicant has passed in the four papers of free-hand, geometrical, perspective, and object drawing of the second grade; or they may be admitted by the Council of the Academy on forwarding specimen drawings. An examination of the students' work is held in the autumn by the President and Keeper in conjunction with an inspector from the Department of Science and Art, when medals are awarded. Professors of sculpture, architecture, and painting are chosen from among the Academicians; professors of anatomy, history, and archaeology from the Honorary Members, or it may be from men not connected with the Academy. Apart from these schools the students have the privilege of working and copying the masters in the National Gallery of Ireland on Fridays and Saturdays throughout the year. There are also excellent art schools in Dublin, subordinate to the South Kensington Museum, at the Queen's Institute, and at the Royal Dublin Society House. Left: The National Gallery of Scotland. Right: the Royal Scottish Academy. Both by William Henry Playfair. Click upon images to obtain larger pictures and additional views of these buildings. The first effort towards the establishment of the Royal Scottish Acaderny was an exhibition of paintings in 1808 held in Edinburgh. 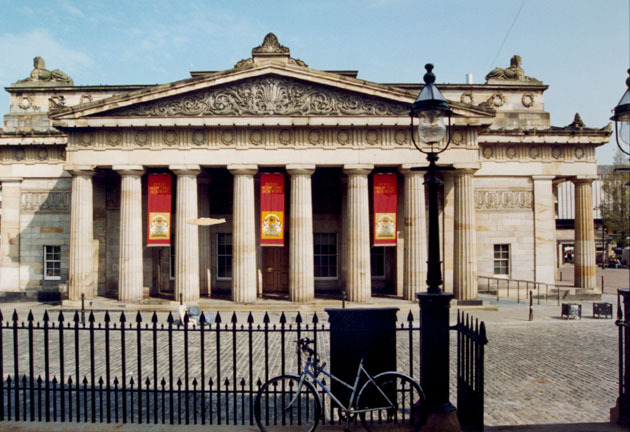 It was followed by occasional but irregular exhibitions of the works of Scottish artists in other years, until, in 1826, the Scottish Academy of Painting, Sculpture, and Architecture was established, which afterwards became the Royal Scottish Academy and received the Royal charter in 1838. Its first President was George Watson, who died in 1837. D. O. Hill, an early Secretary, held that position for upwards of forty years, resigning by reason of ill-health in 1869. Of the thirteen original members, not one now survives, Kenneth MacLeay, the last, having died in 1878. The general plan of the institution is based upon and is similar to that of the Royal Academy of London. 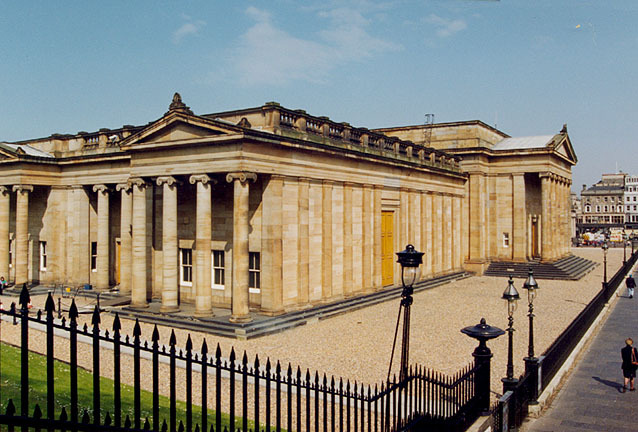 The meetings and exhibitions were held in the Royal Institution, Edinburgh, until the erection of its present home in the National Gallery of Scotland, the foundation-stone of which was laid by the Prince Consort in 1850. While the larger portion of the works sent to the annual exhibitions of this Academy are the productions of native and resident Scottish artists, many of the choicest works of modern painters and sculptors of Great Britain and of other countries are also received. Among other British academies, societies, and schools of art are, the Liverpool Academy of Arts, Liverpool Water-Color Society, the Adelphi Society of Arts, Society of Female Artists, Artists' Society of Langham Chambers, London, and many more in the metropolis and in provincial cities, whose workings and aims are identical with those of which more full accounts are given above.